People spend a lot of their time focusing on Queen Victoria, but the Prince Consort Francis Albert Augustus Charles Emmanuel (but just Prince Albert for short) was also an incredibly influential figure in shaping the city of London. Among other things, he was instrumental in organizing the Great Exhibition (1851), reforming education in Britain, and championed the cause of the universal abolition of slavery. Though their marriage was to some extent arranged, the Prince Consort and the Queen clearly had a loving relationship, and when he died at the age of only 42 in 1861 his passing deeply affected Victoria. She wore mourning garb for the rest of her reign– her black clothing and understated appearance have become closely associated with her iconography and are seen in many depictions and monuments. 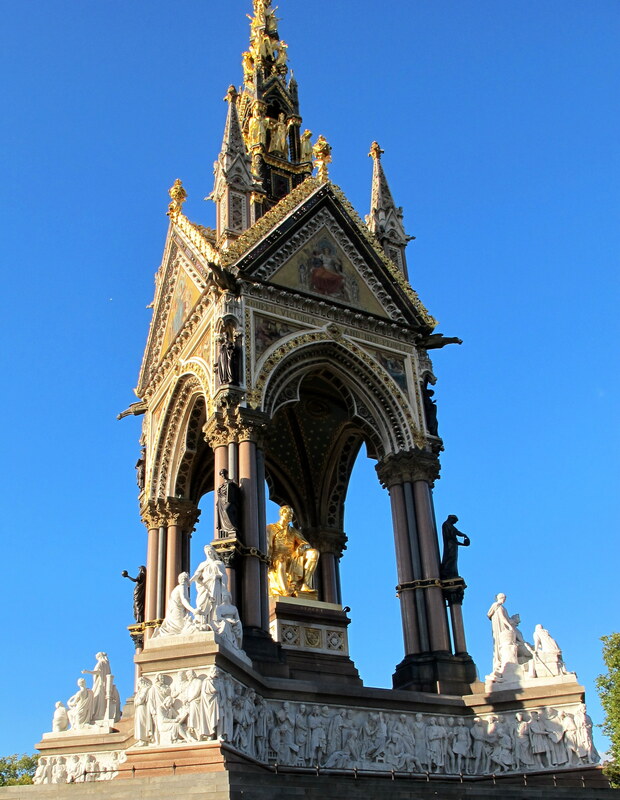 There are many memorials and buildings that carry Albert’s name, and my favorite was the Albert Memorial in the Kensington Gardens. The huge, Gothic Revival-styled architectural part of the sculpture was “opened” in 1872, but it wasn’t formally dedicated by the Queen until the seated figure of Albert was placed into it in 1875. The polished bronze of the sculpture and the gilded angels on the canopy glint in the sunshine and catch the eye even from a great distance. The figure of the Prince Consort is not the only sculptural element of the memorial. There are also eight allegorical stone sculptures that are divided into two groups. One set expresses the Victorian sciences and arts of agriculture, engineering, commerce, and manufacturing, while the second set reflects the continents of Asia, Africa, The Americas, and Europe. The entire memorial is surrounded by a gorgeous iron fence painted burgundy and gold. There are also several mosaics in the canopy as well as a frieze, but the fence keeps you from getting close enough to see these elements well. I was really glad for the zoom feature on my camera, which allowed me to see some details, or you might consider bringing binoculars. This entry was posted on January 27, 2015 by Phoebe Darqueling. It was filed under History, Scholarship, Editorials and Opinions, Steam Tour, The City of London and was tagged with London, Prince Albert, steam punk, Steampunk, Victoria.